When touring colleges, a few elements were integral. I needed a nice dorm, preferably one that did not have cinder block walls and that did not look like a jail cell (Redding, check!). I looked for a nice gym so that I didn’t gain the stereotypical “Freshman Fifteen” that was mentioned at least once on every college tour (Little Bob, check!). I wanted to feel like I was actually on a campus speckled with cherry blossom trees, grass, and pretty brick buildings (The Green, check!). Clubs and activities were also an important part of my checklist in that I wanted to meet new people and get involved (Alpha Phi Omega, Club Tennis, Honors Blog, check!). Oftentimes overlooked by potential college students, academics were also a significant factor in the main reason why I would be going to college in the first place (#81, check!). While all of these elements were critical in making my decision, there was one factor that seemed to affect my choice even more than the rest: the food. Known as “gourmet girl” by my parents and known for my obsessions with the Food Network, cooking, baking, and Tasty videos—I placed a strong emphasis on the need for the university that I would select to offer numerous options when it came to keeping my stomach satisfied. Now in my sophomore year here, I can definitely say that the University of Delaware campus has pleased my request for a food-filled campus. While most students rely on the dining hall for meals, Main Street is what really got me. The mixture of chains and local restaurants, the variety of options, cuisines, and price ranges, and the overall quality of dining gives Main Street its appeal (check!). So, without further ado, let me present to you one of the most difficult lists that I have ever had to compile: Main Street’s Top 5 Eats (in no particular order because that’s simply just asking too much of me, as if these decisions weren’t tricky enough). 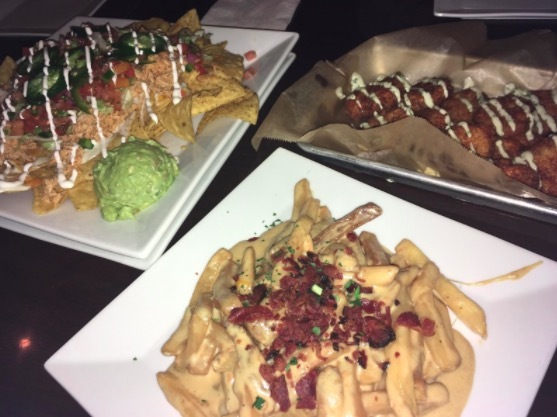 I feel like it would be sacrilegious for a Blue Hen such as myself to not include at least Catherine Rooney’s or Klondike Kate’s; they’re both classic Delaware favorites offering everything from traditional “kid” food of chicken fingers and fries to comfort food classics. Recently among my friends, however, has emerged the debate of the century, and let me just say that I’m team Rooney’s. I had not actually been there until this year, and boy was that a mistake. The atmosphere of the restaurant is homey and cozy (I first went around Christmastime when the place was decked out in rustic red and green trinkets). My go-to, thanks to a friend’s recommendation, is the Jameson Burger, one of their signature items. Topped with Applewood smoked bacon, cheddar cheese, crispy onions, barbecue sauce, and as if that were not enough, coleslaw, this burger is truly one of a kind. Pair it with their sweet potato fry wedges, and you’ve got yourself a meal that really sticks to your bones—perfect for a cold winter day! Ah, good ole Grain. My stomach cannot help but rumble when I think about it. Everything is just oh-so scrumptious. This year, it is safe to say that I’ve been here an unhealthy amount of times, making me an expert on the best of the menu. I’d like to start out by saying that if you have not been here and have never had them, the nachos are to-die-for. Unlike a lot of the other nachos found on campus (which I’m most definitely not dissing…shout out to Klondike Kates’s buffalo chicken nachos, especially when they’re half-price on Tuesdays), Grain uses queso cheese sauce instead of the traditional melted cheese that you would normally find. Then, they load the pile of chips dunked in cheese with pulled chicken and all of your traditional nacho toppings—pico de gallo, jalapeños, sour cream, and guacamole. I forcefully demanded that my friends agree to order these when we went there for my birthday, and I can safely say that we almost fought over who was allowed to lick the plate clean (since it was my birthday, I rightfully won this battle). Another of my top menu items from Grain is their version of a Philly cheesesteak. As a Philly girl myself, I’d say that I know a great cheesesteak from a good one. The bread is pillowy, the onions are salty and the perfect amount of fried, the meat is juicy and tender, and the cheese sauce is creamy, gooey, and melty all in one. Pro tip: upgrade your meal with their sweet potato fries which come with a side of caramel sauce, making them almost dessert-like. Grain is one of my top five because of the fun yet intimate atmosphere, and the high-quality ingredients that compose their traditional yet amped-up menu items. And even better, try going in the spring when you can sit on their porch under the twinkle lights! A University of Delaware favorite, El Diablo has become my recent obsession. While I hate to actually admit this, it’s become my Wednesday night go-to this semester after my weekly Butts n’ Guts class. Incomparable to Chipotle (just down the street), El Diablo offers an extreme number of toppings that cannot be found at similar restaurants. At El Diablo, you can pick your type of cheese, add pineapple salsa for a tropical flare, top off your burrito or bowl with jalapeños and pickled onions, and drizzle it with one of their homemade dressings. My classic is a brown rice bowl with chicken, pepper jack cheese, lettuce, sour cream, mild salsa, pineapple salsa, and corn salsa. The quality of the ingredients shines through every time I go—each component of my bowl is fresh and vibrant, bursting with flavor and color. Additionally, for all of the broke college students out there, El Diablo serves enormous portions for such reasonable prices; you can get a burrito or bowl—loaded with as many toppings as you’d like—for around $9.00. Does it get better than that? I only started getting El Diablo this year, but I must say that for those of you that like California-style Mexican food, be careful because it is truly addicting. The final addition to my Main Street Top Five is none other than Main Street’s fanciest establishment. I will say that Café Gelato is the place to go when you have family in town who would be willing to treat you to the polar opposite of dining hall food. Café Gelato features an upscale menu and an elegant dining experience. Whenever I walk along Main Street and look into Café Gelato, I see what I still consider “grown-ups,” people who are not my fellow college students running all over the place and eating whatever they can get their hands on first. Going to Café Gelato is a transformative experience. One of my favorite menu items is the four-cheese tortellini in Parma Rosa sauce. The pasta was tender, and I could have licked the bowl clean of the sauce (that is, if I wasn’t in a fancy restaurant!). And, to make it even better, a meal at Café Gelato would not be complete without gelato, of course. Be sure to try the coconut and the salted caramel because you most definitely won’t regret it. Overall, Café Gelato is the place to go for a special occasion, to celebrate good times with good people over really good food! At the University of Delaware, we’re so lucky to have such amazing options right next to campus. Food is such an easy way to connect with people and to make new memories. The options are endless – that is, until you get too full and need to be rolled home. I hope that my Main Street Eats list has been mouth-watering, tummy-rumbling, and palate-awakening!